The housing and economic crash of 2008 kept more people from moving to cities during the last decade. Census data from 2010 indicate that while urbanization continues, it slowed in the last decade to 10.6 percent growth in metropolitan areas of more than 1 million. This growth rate is down from 14.6 percent in the 1990s and 12.6 percent in the 1980s. Fourteen of the 15 most populous cities at the start of the decade either grew more slowly or lost population by the decade's end. And while the 50 largest metro areas collectively grew by 3.7 percent in the 1990s, that growth was more than halved to 1.3 percent from 2000 to 2010. In every decade but one between 1790 and 1970, America's urban population increased by more than 19.5 percent. It was only during the 1930s, when the economy faltered and tariffs effectively closed borders, that America's urban growth slowed dramatically. as the subjective reflection of this complex system of spatio-functional allocation, citizens will develop the most highly refined forms of personal and professional conduct, etiquette, and style. It is the city that breeds civilization and civilized life. In Triumph of the City, Glaeser makes the comment that he has "a taste for free markets," but anyone interested in his book should know going in that the author's free-market palate is slight; and the author's blind spot for markets and soft spot for government monopolies keeps an interesting book from being a great one. The author gets off to a good start, pointing out that cities run by merchants grew much faster than cities led by princes and monarchs. Cities like Florence and Bruges were "havens for innovation and were the nodes of a global trading network that brought in the knowledge of the East." These "commercial cities developed the legal rules regarding private property and commerce that still guide us today." 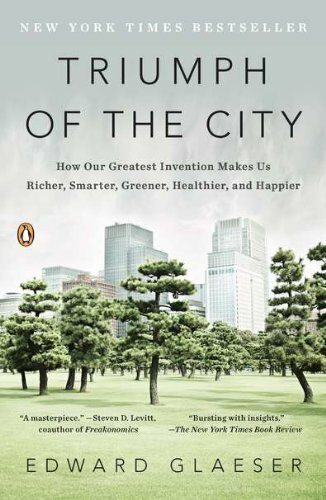 Glaeser understands that, in the information age, "ideas are the ultimate creator of wealth" and that the perception that cities serve only to breed a poor underclass is unfounded. The part of the world that is rural and poor moves glacially … while the part of the world that is urban and poor is changing rapidly. There is opportunity in change. However, the author blames the Taft-Hartley Act of 1947 for "allowing" states to pass right-to-work laws, leading to the demise of the Detroit auto and New York garment businesses. High union wages didn't immediately hurt Detroit in the decades after WWII, but Glaeser gives his bias away, writing, "the car companies weren't above trying to open new plants in states with lower labor costs, which is why Detroit was losing people even before the car industry began to decline." The author refers to wealth redistribution as "well-meaning" in places like Detroit but is resigned to the fact that high local taxes send businesses and wealthy individuals elsewhere. Addressing Detroit's decline, Glaeser makes the salient point that Henry Ford's car making on a massive scale was "antithetical to the urban virtues of competition and connection." But in the next sentence the author comes to the faulty conclusion that because automakers can build cars with low-skilled employees, the city is harmed in the long run. Why is that that the poor and the unskilled move to urban areas? As Glaeser explains, "Urban density makes trade possible; it enables markets." But more importantly, cities "provide a wide range of jobs, often thousands of them; a big city is a diversified portfolio of employers." This wide range of job opportunities allows employees to discover what they are good at — something that isn't as possible in a rural setting. "The author's blind spot for markets and soft spot for government monopolies keeps an interesting book from being a great one." The author amplifies this point in his chapter about London. British actors from Shakespeare to Olivier learned their stagecraft from other actors drawn to that city. This extends to all areas of commerce, but especially restaurants. Go to any big city and, as Glaeser writes, "a wide array of restaurants offering a dizzying cornucopia of culinary styles, price ranges, and atmospheres" are available. The Harvard professor even puts some numbers to this. While there are nearly double the number of people working in grocery stores as opposed to restaurants in the entire United States, in Manhattan 4.7 times more people are employed at restaurants than grocers. And during the boom years of 1998 to 2008, restaurant employment in the Big Apple soared 55 percent. Cities provide not only job opportunities but romance opportunities as well, a point Hoppe makes. Glaeser writes, "Manhattanites are much more likely than other Americans to be singles between the ages of twenty-five and thirty-four." Dating and working are not the only activities that cities foster. Interest in Austrian economics rose from Mises's New York University seminar attended by Hans Sennholz, Israel Kirzner, George Reisman, Henry Hazlitt, and members of the Circle Bastiat — Murray Rothbard, Ralph Raico, Leonard Liggio, and Robert Hessen. At the same time, the Objectivist movement began in Ayn Rand's New York apartment. Glaeser refers to Jane Jacobs early and often, claiming that "many of the ideas in this book draw on the wisdom of the great urbanist." However, while Jacobs argued against local planning, believing cities developed best when left to spontaneous order, Glaeser looks to government to provide police, education, and utility infrastructures to make urban areas thrive. The author is rightly against bailing out old industries and spending on unneeded infrastructure projects. But he believes the poor should be bailed out. So while he champions the idea of the poor moving to the city for employment and training opportunities, putting these people on welfare and other state assistance stops the very dynamic process that cities provide. And while he recognizes that cities thrive when business is dominated by small competing firms, he looks to a strong local monopoly government to clean the streets of crime, provide safe drinking water, and educate kids. law and order within a big city, with its intricate pattern of physical and functional integration and separation, a great variety of jurisdictions, judges, arbitrators and enforcement agencies in addition to self-defense and private protection will come into existence. There will be what one might call governance in the city, but there will be no government (state). Hoppe recognizes the very reason some cities are losing population: "The delicate balance of peaceful interracial, interethnic, and interfamilial cooperation, achieved through an intricate system of spatial and functional integration and separation, will be upset" with a monopoly government. At the same time that entrepreneurs and creators are harnessing the creative energy that urban areas provide, big-city bureaucracies only manage to levy excessive tax loads as infrastructure crumbles, public schools fail to teach, and the court system focuses on locking up people for made-up crimes. One can expect nothing less from a monopoly provider. It's also not surprising that urban growth has declined subsequent to Richard Nixon cutting the last thread the dollar had to gold in 1971. Not being shackled to the yellow metal (or anything else), the Federal Reserve has unleashed a torrent of inflation, the results being a constant unraveling of the division of labor. Our culture, our prosperity, and our freedom are all ultimately gifts of people living, working, and thinking together — the ultimate triumph of the city. The state — a judicial monopoly — must be recognized as the source of de-civilization: states do not create law and order; they destroy it. Families and households must be recognized as the source of civilization. Turkish Daily News, July 14–15, 2007.